Well, gentle readers, we have weathered yet another great storm. For many years the existence of the League has protected us from the horrors of unrestrained magic. Unfortunately, the rise of the Lich Queen in the Shurima Desert demonstrates that the old magics are still out there, still potent, and still highly dangerous. Having found myself in Shurima already at the time of her awakening, in order to cover the ongoing Hextech conflict, I disguised myself as one of the undead and attempted to approach the cursed pyramid. Upon drawing close enough to see it piercing the horizon, however, even my normally steely journalist’s nerves failed me, so powerful was the feeling of dark magic radiating from it. So, maintaining my disguise, I joined the undead horde marching towards Bandle City, hoping in some small way to aid the living by gathering information about the dead. It was a harrowing journey, beloved readers, the details of which I am loath to recount. Suffice to say that the march was hard, as its (other) members were unfeeling, and needed no sleep or food. Yours truly was able to survive by hurriedly leaving the columns of the dead, gathering what food I could, and then returning to their nearly infinite ranks. The undead, fortunately, were unobservant and unthinking, and so long as I appeared to be one of them (by use of a minor glamer by which I have disguised myself for many a scoop) no peculiarities of my behavior seemed to bother them overly much. In fact, so oblivious were the Lich Queen’s soldiers that I was even able to rig a crude pallet upon which they dragged me when sleep became a necessity, apparently without them noticing. Not all of the Lich Queen’s subjects were so mindless. The Champions of the League whom she had enslaved retained their minds, and large parts of their personalities, though they were incontrovertibly bound to her will. Often they would range out when the horde approached a village, to spread terror and death to its inhabitants, thereby swelling the ranks of the dead. Always, Hecarim returned with the blood of innocents upon his guisarme, and Thresh with his lantern glowing brightly with the more ethereal remains of the villagers. Human and Yordle alike fell to the terrible creatures, and I began to fear that I should spend the rest of my life within the horde, and likely an unlife after, should Bandle City fall to the swarm of the undead. As you all know, my fears nearly proved well founded, as the front lines of defense crumbled before the horde, despite being formed from the armies of three of Bandle City’s allied city states. Both Zaun and Piltover proved their might, holding the undead back for nearly as long as Bandle City had determined was necessary for their preparations. Unfortunately, the early failure of Demacia’s lines provoked a chain reaction whereby the forward positions were lost. I shambled through the wreckage of the Piltovian position, and it was all I could do to hold back tears at the thought of the same thing happening to the poor Yordles of Bandle City. I had to hold them back, however, for Evelynn had been put in command of my detachment, and such a display of emotion would have resulted in your humble friend’s hide being added to her rumored collection, and I doubt she’d be nice about it! Imagine, then, my elation when the sounds of battle grew closer, and an unexpected alliance of the three nations began to press back the hordes! Caitlyn, Shyvana, and Viktor should be celebrated throughout Runeterra for their valiant holding action against the undead. I fully believe that without their aggressive defense, Bandle City’s defenses would not have been ready for the horde, and we would be discussing a very different outcome of the historic battle! 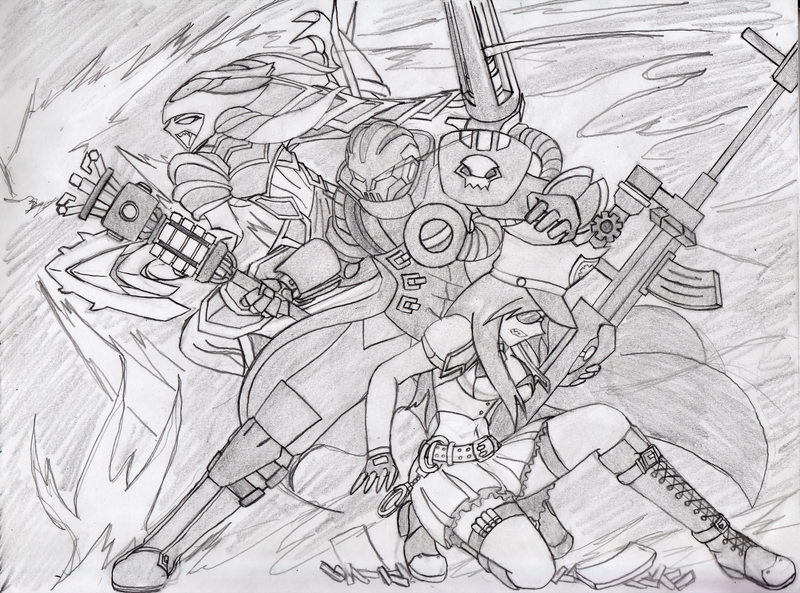 A battlefield sketch by Summoner DarkbreakerEx. Of course, even such brave souls and martial prowess as theirs could not hold back the Lich Queen’s forces forever, but they had purchased with their efforts that most valuable commodity: Time! Hope stirred in my breast as the walls of Bandle City hove into view, bristling with weapons and defenses as so expertly prepared by the finest minds of Zaun and Bandle City. Hope was followed shortly thereafter by absolute terror, as your noble friend realized that all of those defenses would shortly be directed in my approximate direction. Fortunately, not all of the defenders were as unobservant as my erstwhile comrades, and as the attack began, with bombs and hexplosive devices cratering the earth all around, my quite unconcealed (and also quite appropriate) terror was noted, and I was allowed to approach the wall unexploded, a gift for which I am most grateful. The remainder of my report is known to you all through the widely distributed report which I submitted to the Council after the battle. How the undead pushed the defenders back, despite Zaun’s overwhelming firepower, how the Yordles’ brave defense resulted in minimal casualties, considering the magnitude of the threat, and how, at last, Demacia’s Void Purification magic purged the undead, and freed the champions enslaved by the Lich Queen’s will, are all matters of public record, and I have little, now, to add to them. I may only hope, dear readers, that the bonds of solidarity and friendship forged in the horrific Battle of Bandle City will endure, and usher in a new era of amicability and alliance amongst the factions which had heretofore been engaged in the fighting over the sands of Pyrikhos.